For Abby Adesanya, the founder of the women’s literary club, Novella, it’s all about creating a space where women can respond to the world through written and spoken word. As opposed to traditional books clubs, Novella comes with three mandates––you must write, you must be willing to share, and you must be curious. At monthly salons, attendees are encouraged to share their writing in groups and keep the conversation going by responding to monthly writing prompts. Despite the group's youth––it’s the first salon was in October 2017––Adesanya’s goals for the group are lofty and well considered. In an interview with Afriquette, Abby Adesanya discusses her aspirations for Novella, and her passion for literature. Does being African play into your love for literature? My parents are both Nigerian, but I was born and raised in an all-white town in New Jersey. I've been reading for a while, but I became aware of African writers and African artists later in my life. I wasn't exposed to a lot of Nigerian literature until I went to college. I kind of found them on my own. What was that process of discovering African art for yourself? How did that happen? Once I got to college, I started meeting more people of color. I met Ghanaian women and women from Ivory Coast. I met people who were like me, who were dark-skinned, and African. I’d heard Fela songs my whole life, in my dad’s car or at Nigerian birthday parties, but I’d never associated it with a person. Later in my life I was like, ‘who sings this, who plays this, who made this?’ And that’s how I slowly started to be more familiar with the art. How did the idea for Novella come about? I started thinking about Novella early last year. When you move to New York, you kind of realize that everyone is like, ‘I'm going to do this, I'm going to do that, I’m going to start a blog,’ and every time I tried to do something like that––be a blogger or something like that––it just felt so unreal and nothing like me at all. I was also this person that used to write all the time, write stories and read so many books. It was almost a year that I had been living in New York and I realized that I hadn’t read a book, I hadn't even written a poem. It was such a strange thing to realize because reading and writing had been such a big part of my life for such a long time. And I know it’s a weird thing to say, but I actually dreamt it [Novella.] I can confirm this because I woke up at 2 am and I saw the note in my phone with the name Novella. I thought, okay, it’s a book club and then what? The idea behind Novella is incredible because it is a community. It's really different from a regular book club because of the process, the sharing process and the way things work. How did you get the idea to incorporate that? 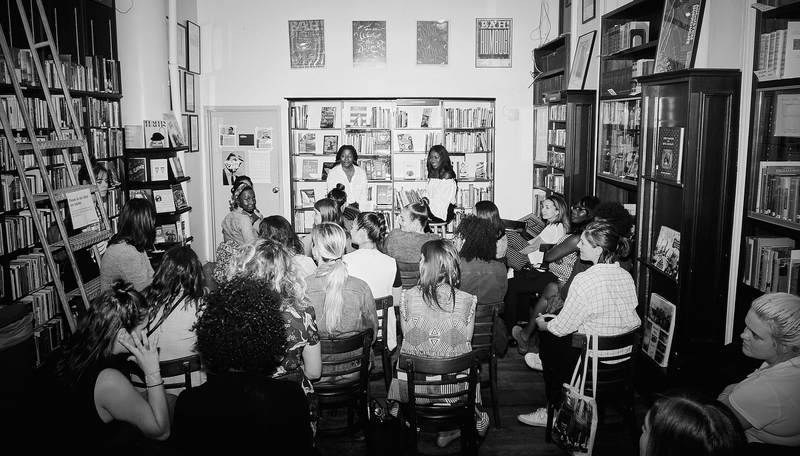 The community aspect of women coming together, sharing their stories, and learning from one another like that is not a part of many book clubs. Also, the fact that Novella is almost requiring it, requiring that participation, fosters a sense of community in itself. But I didn't have the idea for it immediately, it took like 3 to 4 months for me to get to this place. Having the women that have gathered around Novella seems like an incredible support system to have. Could you share some of the feedback you received from the women who attend and participate? It's been great because Novella is not perfect, but I'm getting very constructive feedback, which is so helpful because I want Novella to feel natural, I want Novella to feel like a safe space for women. I want it to feel real, you know? The monthly salons are more about creative expression as opposed to craft-honing, so we’ve gotten some feedback about that and we’re working on some really cool stuff for the women to hone in on their craft, create, workshop, and critique. We’ve got suggestions and feedback and recommendations. We’ve also gotten a lot of feedback from women just saying, ‘I feel like I needed something like this.’ It’s been a really humbling and inspiring experience. I’m curious about where you want Novella to go? What do you see it becoming? I would be so happy to have Novella be a place where people can find talent. A place where people can go to find emerging female writers, it would be so incredible to have Novella be a reputable source, and I think we are figuring out ways to make that happen. Novella is a place where women’s stories are shared and encouraged, and I would love for Novella to be the place that if you want to hear about what’s going on and what the female experience is, that’s where you go. So we’re trying to figure out ways to make that happen and figure out ways to give emerging writers access and the microphone to express themselves. Which books by African authors are you currently reading and loving? I love Lesley Nneka ––she’s so good. Every story in her collection, What It Means When A Man Falls From The Sky, is so vivid and she writes so beautifully. A book that I just received from a friend and I need to crack open is What Is Not Yours Is Not Yours by Helen Oyeyemi. Another book I’m reading is Bones by poet Yrsa Daley Ward.